Sainsbury's will cut 500 jobs at its store support centres as part of its plans to cut costs. The cut represents about 13% of staff in the roles affected, the supermarket chain said. But the reduction in staff could affect more people as the supermarket abolishes some jobs and moves workers to other roles. 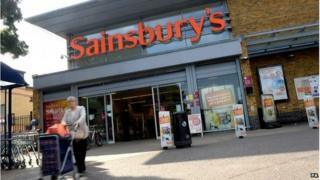 In November, Sainsbury's said it planned to make £500m of savings in the next three years. There will be a consultation process to decide precisely which jobs will go. "We want to work through this period of uncertainty as quickly as possible, while making sure we consult with colleagues who are affected by these changes," chief executive Mike Coupe said in a letter to staff. "We're committed to treating all impacted colleagues with respect, during what we know will be a difficult time." Britain's biggest supermarkets are trying to claw back custom from discount stores such as Lidl and Aldi and are cutting costs to reduce prices. Tesco has said it will close 43 unprofitable stores across the UK - more than half of which will be local convenience shops, known as Tesco Express. Morrisons said it would close 10 loss-making stores in 2015.